According to the Masonry Advisory Council, brick has a useful lifespan that can exceed 100 years, but the mortar joints that hold bricks in place have a useful lifespan of only about 25 years. The more mortar joints deteriorate, the greater the chance for potentially damaging water penetration. 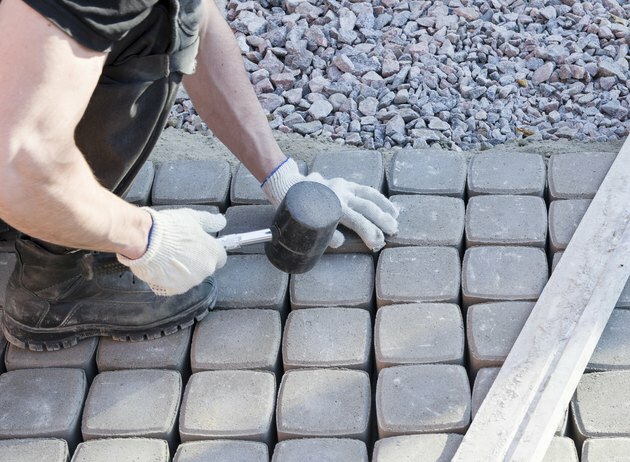 Tuck-pointing is a method for repairing defective joints, but because the process is labor intensive and every job is different, there is no standard cost per square foot. Instead, most contractors will submit a time and materials estimate. An overhead view of a masonry worker using a mallot. Inspect and lightly scrape mortar joints with a metal tool to identify areas that require tuck-pointing. Note areas where there are cracks between the mortar and brick, where mortar is crumbling or has hairline cracks and where you see mortar erosion more than 1/4 inch. According to the MAC, this step is critical, not only because tuck-pointing can be expensive, but also because original mortar joints in good condition are preferred over tuck-pointed mortar joints. With tuck-pointing jobs, most of the costs involve labor and setup. If the job is in a location without easy access, it will generally take more time, labor and equipment. A job in progress may also incur additional costs for services such as restoration cleaning or repairing damaged bricks once it gets underway. Unlike a fixed-fee estimate that quotes a specific amount, a time and materials bid identifies the worker's hourly rate and the cost of materials -- including a profit margin -- based on an initial determination, but leaves the door open for additional charges. Describe job details in the first section of a time and materials estimate. Start with quantity information, including the size of each damaged joint and total linear feet, the size and job titles for each crew member, an estimate for the linear feet the crew can tuck-point in an average work day and the estimated duration of the project. Finally, identify any special equipment, such as a lift truck, that must be rented to complete the project. The body of the estimate contains labor, materials and equipment cost breakdown information. For each area, specify the quantity, the unit of measurement, such as hours, weeks or bags of mortar, the unit cost and the total cost. Add the totals for each cost breakdown category and calculate the percentage each contributes to the total estimate. Finish by adding in the cost for office overhead and the profit margin to create a grand total.